Arbitrary List to Determine Your Literacy! According to someone, the average American has read only 6 of the books listed below. If you are so inclined, copy the list, bold the ones you've read and italicize that ones you're currently reading or plan to in the future. Personally, I feel the list is too Austen-heavy and lacks much modern/contemporary literature. I could go into a discussion of the canon, but that's for another day. I've read only 16. There's a lot of work to be done. "There is always a risk that education may put you at odds with the tasteless, clueless philistines who run the world and whose lexicon stretches only to words like oil, golf, power and cheeseburger." It's pretty obvious that the media has a bizarre fascination with Barack Obama. Some may even say it's a love affair. We want you to be the judge. We've compiled two videos of the more outrageous moments of this not so secret love affair. Follow this link to watch the two videos and vote on which one you think is better. Your vote will determine which video we put on the air. The media is in love with Barack Obama. If it wasn't so serious, it would be funny. I know that yesterday I said I wouldn't elaborate about how amazing Sigur Rós' new album is, but I just can't resist. I should be sitting here preparing a presentation on Stuart Hall, but I cannot stop listening to the song "Ára bátur" (which, apparently, means 'row boat) from the newest album by the Icelandic troubadours. The only way to describe the song that is even remotely fitting is triumphant. Not in the "Magic Power" kind of way but in a way that makes me feel as if I've won something just by having purchased the album. I am always a little bit fearful when a favorite band releases an album but there is absolutely no disappointment from this latest release. If you will only indulge me, please listen to this song. Like Sam says, "It'll change your life, I swear." So who needs to keep a blog schedule, right? Today I'm supposed to talk about something political; but I'd rather talk about something music related. Music is a lot more fun than politics most of the time anyway. What have I been listening to recently? 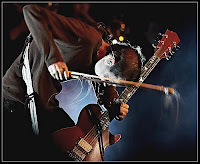 The last week or so has been devoted to the new album called Með suð í eyrum við spilum endalaust by Sigur Rós (there's a lovely pronunciation of the album name on Wikipedia and the translation is 'with a buzz in our ears we play endlessly). I would go further in explaining the awesomeness of this album if I thought it was necessary, but everyone knows how fantastic these Icelandic post-rockers are so I'll just leave it at that. What I really want to talk about is the band Mates of State. Their newest album, Re-Arrange Us, is my first experience with the band even though it is their fifth release. The band is made of of a husband-wife (Jason Hammel and Kori Gardner) team who make great music. Their sound is fairly simple yet sonically powerful at the same time. I know that is probably not a very convincing statement but it's the best I can do with it. From what I can understand, Jason provides most of the rhythm and Kori is most frequently on the keyboards, she also handles most of the vocals on this particular album. There are significantly intricate drum rhythms that hold up the drive of the songs and this spine keeps the keyboard from feeling naked without a guitar alongside--something that bands like Keane fail to do. Mates of State, however, does use the guitar occasionally but it is certainly not a feature of their sound. The best feature of the band has to be their fantastic vocals combined with the insightful lyrics. Neither of their voices are what I could consider great, but they work so well with the sounds that accompany them. I am convinced that marriage brings a certain closeness that can be felt when two people sing together and that is certainly the case for Jason and Kori. There exists a tightness in their harmonies that is nearly unexplainable. Jason often pushes toward the top of his range but it is complemented by the subtle energy of Kori's jangly voice. At the top of their voices they occasionally push beyond what seems comfortable and it sounds almost ethereal rather than forced. Overall, it's a wonderful album and I'm rather excited to get deeper into their catalogue. Also, they look so cool. Listening to NPR this morning (really, it was new from NPR on WXPN--the best radio station ever, I digress) and they aired a brief spot on negotiations regarding American troops remaining in Iraq. The basis of the piece was that a UN mandate is allowing American forces to remain in Iraq until 2009; but after that date Iraq has to agree to be occupied. I realize the use of the word 'occupied' is perhaps too severe, but it's what I'm going with. Negotiations are underway and may not be swinging the way our administration wants it to. The news person quoted an Iraqi official as saying, "We do not want to become colonized." His use of the word 'colonized' is, by no means, too severe. I do not think that we, as Americans, can think of ourselves as colonizers in the same way that we view the British and French sprawls of the 19th and 20th centuries--but I, and others like Niall Ferguson, believe that we are quickly headed that way. Unlike me, Ferguson believes it is America's duty to take up the flag of imperialism and usher forth a new golden age. Though I am sure he is brilliant, I think Ferguson thinks a bit too highly of the British empire and cannot see past the good parts to the negative underbelly of Victoria's land grab. While I'm not an isolationist, I do not want to live in the nexus of an empire. Literature acts on the world by acting on its readers. "Literature professors are salaried, middle-class shamans." Not only, Greenblatt argues, must the professor commune with the dead authors but he or she must also find meaning from the author's societal culture. It is not surprising that Greenblatt would place great emphasis on the impact of culture--he is, after all, the man who coined the phrase 'New Historicism.' Though explorations of cultural influence and social energy is fascinating, I was struck by the thought of being a culturally sanctioned shaman. I, for the time being, want to devote my scholarship to contemporary American literature. The bulk of the authors I will encounter are still alive or have been living during my life but I will still be working to converse with people whose audible voice I may never have the chance to hear. At the same time, even if I could sit and interview the great authors of our age, they are not the same people they were when they penned their works. As Foucault argues, the author is not even the same person as the person who owns the physical body that produced the text, he or she is, in fact, a social construction. That being said, there is always a great distance between the author and his or text--indeed, between the author and his/her self. Here's the fun part: the professor/scholar/reader gets to play in that gap between author and text. Along with the aforementioned gap, there, too, is a gap between the culture that influenced the author and therefore the creation of the text and the culture in which that text is consumed--that is more room for play. In the last few months, I have been working to develop exactly why I want to be the scholar that I am striving to be. I've always enjoyed doing literary scholarship and have considered the concept of getting paid to do what I thoroughly enjoy enough to justify my choice of profession; but that has recently not been satisfying. In an answer to my quest, I've rediscovered the importance of literature. Literature--yes--can be aesthetically pleasing all on its own. Without the aid of a professor or literary scholar, one can enjoy a work of literature purely through its aesthetic merit. I am quite content that texts are enjoyed for this reason, but they can be so much more: that is where my passion comes in. Through effort with guidance, the reader can not only get better at interpreting a written text but better at interpreting the world around him or her as a text. This ability to produce thinkers is the vital element of literature and it is, ultimately, the final goal of education--not just English classes. When thinking about being a professor/teacher/crazy guy on the street corner yelling about the great American novel, I've long considered it enough to share with students my passion and joy that is found in literature but I am slowly realizing that if I do only that, I will have failed as an educator. Literature can do more than just be fun or relaxing and my goal is help others see this. As Paulo Freire says, we must teach our students to read the word and the world.